The Post 2012 World - When the Mayan Calendar ends, what will the post-2012 world be like for you?... 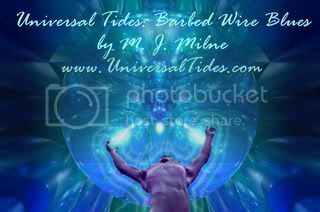 Find out the secret way of the 12 Golden Keys by reading Universal Tides: Barbed Wire Blues by author M. J. Milne. Read how to become a homo-luminous being, as opposed to getting stuck in homo-sapien. By using the 12 Golden Keys you can open your Third Eye onto the parallel Otherworlds. It’s all there! The only survivalist fiction book you can download from the Internet that will tell you the truth. Know what to expect in the upcoming (R)evolution of Soul and know what to look for. You and I are here to heal our souls. Earth is a rest stop on our journey. It’s not meant to be a struggle, but we’ve forgotten the true essence of why we’re here. Love with all your heart because so many here need your divine love and joy. Anyone who comes at you with violence in his or her heart is seeking that divine spark of love inside themselves. They don’t know it of course, but you know it. You are the wise one. Tell them they are about to go on a journey because God loves them. Tell them the journey begins in this very moment. Let them know that the universal soul essence in you, is in them. Speak your authentic truth out loud, without fear. Live loud truth! And everything that you love becomes enlightened with your divine spark and affects everything and everyone around you. Then stand back and watch the magic happen! The Spiritual (R)evolution is here! Scientists now admit that parallel universes do exist. Parallel universes are in the novel Universal Tides: Barbed Wire Blues (Utides/BWB) and the characters enter through the gateways using the secrets of the 12 Golden Keys. This amazing discovery - that the movement between parallel universes is real – is now open to unlimited scientific possibilities. Catch the wave and don’t get left behind: Read Utides/BWB. Parallel universes really do exist, according to a mathematical discovery by Oxford scientists described by one expert as "one of the most important developments in the history of science". The parallel universe theory, first proposed in 1950 by the US physicist Hugh Everett, helps explain mysteries of quantum mechanics that have baffled scientists for decades, it is claimed. © Copyright Press Association Ltd 2007, All Rights Reserved. FREE Lessons on Becoming a Spiritual Warrior! Hung Up in the Illusion?